This Page is dedicated to the 19th century and how we wish we were there! Southeastern Colorado is a historian's haven. 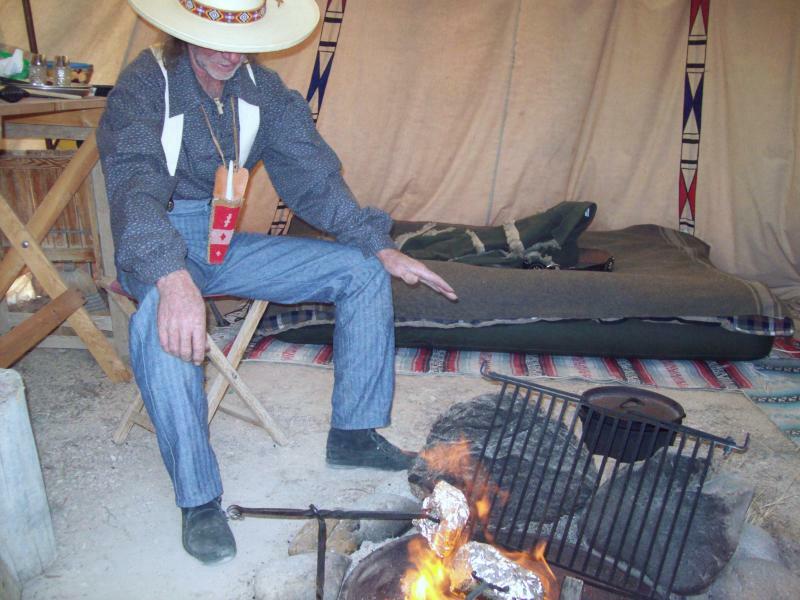 Most of the living history at High Plains is inspired by the region's Fur Trade era of the 1830's and '40's and the decades after. We begin with our tribute to the Plains tipi. Many of our skills and traditions center around this marvelous structure. 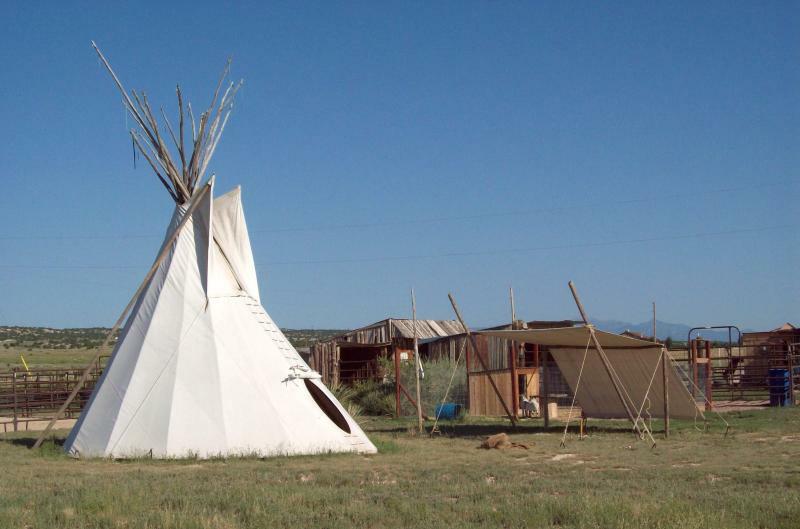 Our 18-foot tipi is set up during special occasions and the fall through the holiday season. Here we cook, sleep, relax, celebrate, craft, talk, entertain, and connect with each other and our inner spirits. 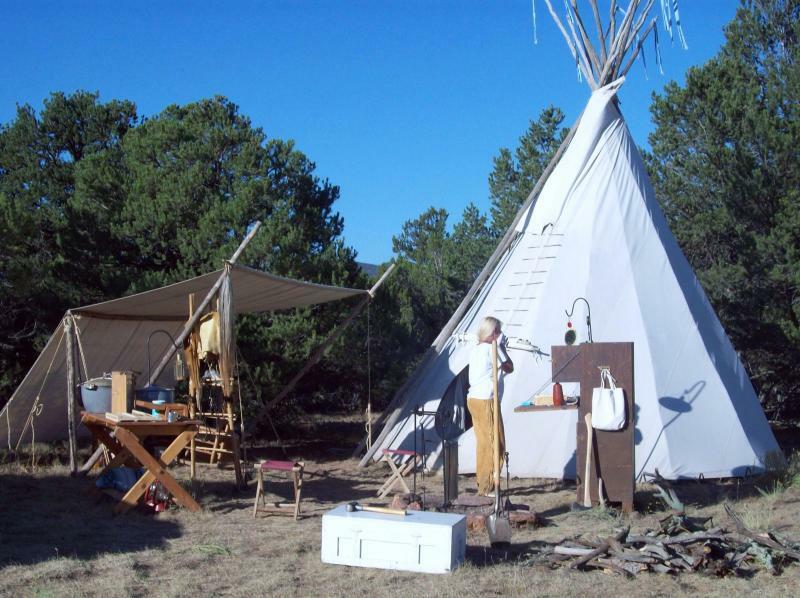 Our tipi is roomier than our living room and serves as an extended kitchen, second bedroom, and auxiliary bathroom when outfitted with a portable shower and commode. Our tipi isn't a lawn ornament or toy but our sanctuary. We feel complete when it is set up, worry about it when the wind blows, feel dejected when we take it down, and leave the poles set up for the pleasant memories and beauty they instill. Toss coffee into cold water in coffeepot with no insides. Set coffeepot over fire and let the water bubble up and settle down four times. Use your dirty sock as a potholder and the flat rock as a rest for the coffeepot between bubblings. Settle the grounds with a little cold water poured down the spout. Make extra to share with neighbors who stop by to visit. Considerate neighbors bring their own cups. 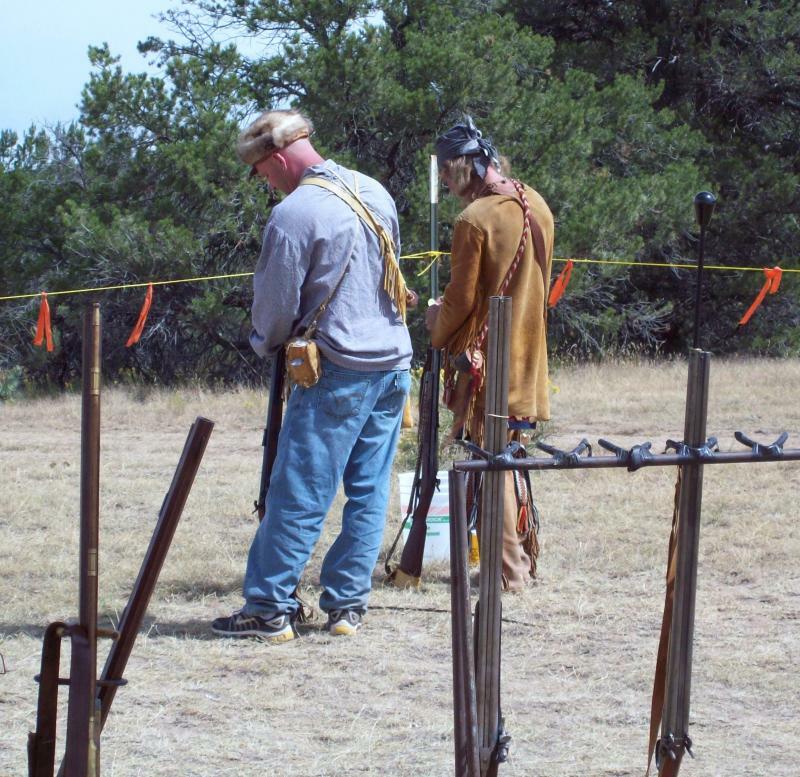 Shooting black powder muzzle loaders is integral to re-living the mid-19th century. Then as today, muzzle loading supplies us with meat and provides opportunities to compete, socialize, concentrate, and focus. Can you name the steps in loading a black powder muzzle loader? Currently, our 19th century crafts include brain-tanning hides, hand-crafting leather clothing, bags, and footwear, designing and assembling jewelry and hair ornaments, soap-making, beadwork, constructing powderhorns, hand-crafting knives and sheaths, and hand-wrapping smudge sticks. Our little house is filled with knives, leather and rawhide, smoky clothing and blankets, sticks and wood, jewelry, muzzle loaders, bags, beads and beadwork, fur, bones, and powderhorns in various stages. We cultivate new crafts and phase out others as our interests, supply sources, and customer requests evolve. Crafting is an ideal way to connect with our inner buckskinner; just handling the leather, beads, and hairpipe generates ideas, conversation, and energy that ultimately produce a personal, hand-made artifact. Crafting is also economic. Attending Rendezvous has costs such as gas, groceries, and fees. We off-set our costs by spreading out a trade blanket in front of our camp and selling and trading our finished crafts to other Rendezvousers and day pilgrims. Please accept this small token of my appreciation. In Peru, they call this "ayni" (eye-nee) meaning sacred reciprocity. These are from the bird called the "Indian Roller" which is one of my power animals. I wanted to share them with you. I hope you enjoy whatever you do with them. Thanks for the tour . . . . . I would like for a friend of mine to come with me and experience your place if that would be okay. She would love it too. Do you have questions or comments? Contact us anytime! We look forward to hearing from you. Visit the Trading Post and ﻿Blog﻿ to learn more about the hand-crafted items described on this Page.